Don't struggle trying to create artwork to the correct specification. Our studio will create your artwork FREE OF CHARGE, taking the hassle out of the ordering process. 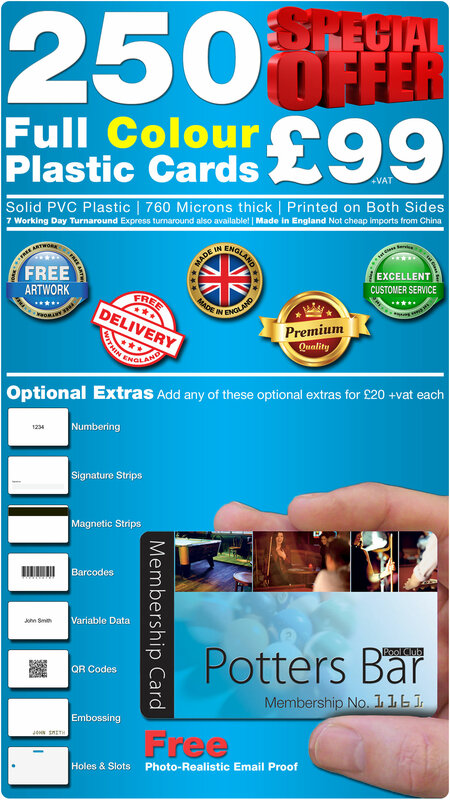 We will ensure that it is created correctly so your plastic cards print perfectly. We also will hold your artwork on file for when you want more cards plus we can make changes for you should you need any. 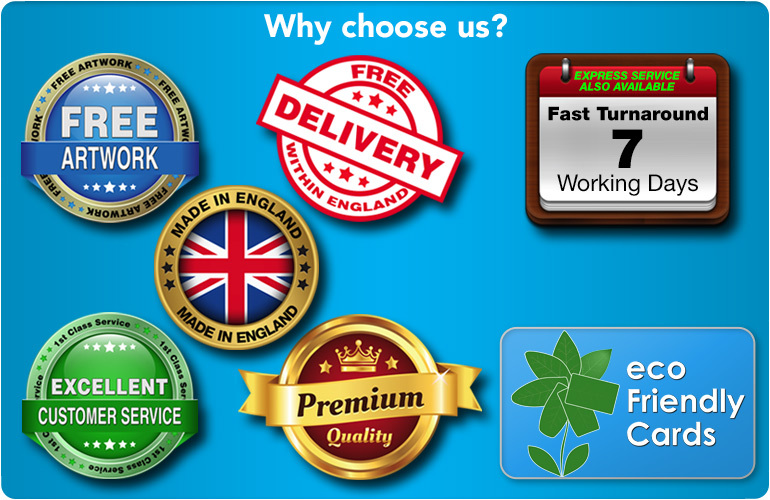 We understand that no one likes to pay delivery charges or any hidden charges so all our prices includes FREE DELIVERY within England. 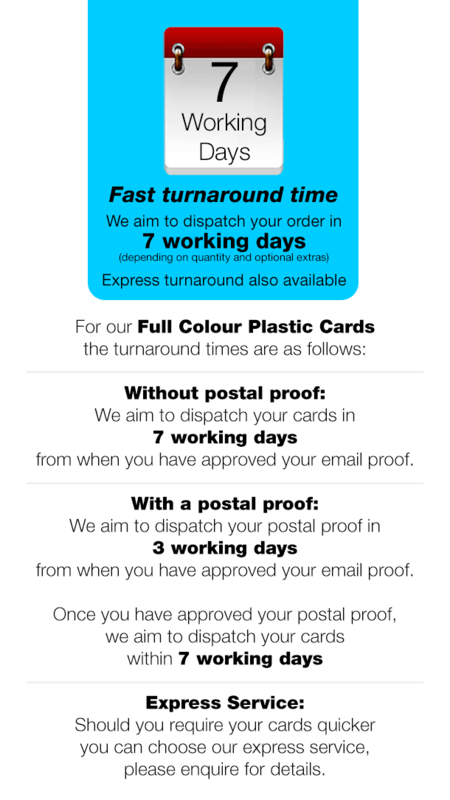 All our plastic card orders are sent by next working day courier so you can receive and start using your plastic cards without delay. 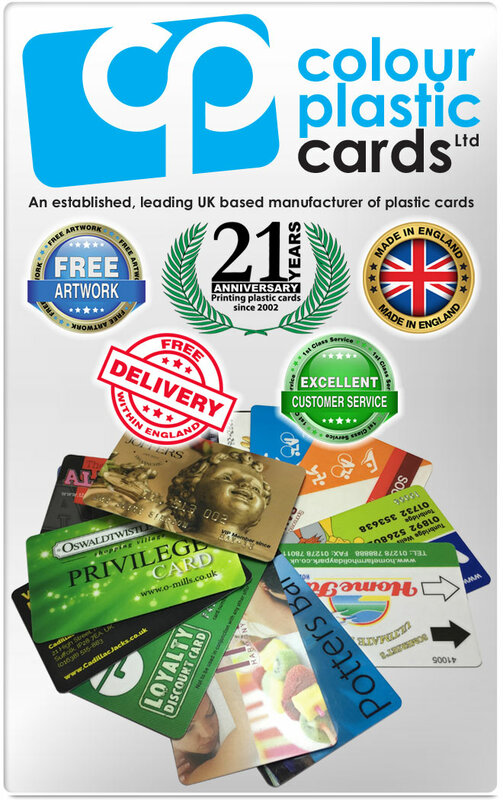 We offer very fast turnaround on all orders because we print all our plastic cards right here in the UK plus we have complete control over the manufacturing process. 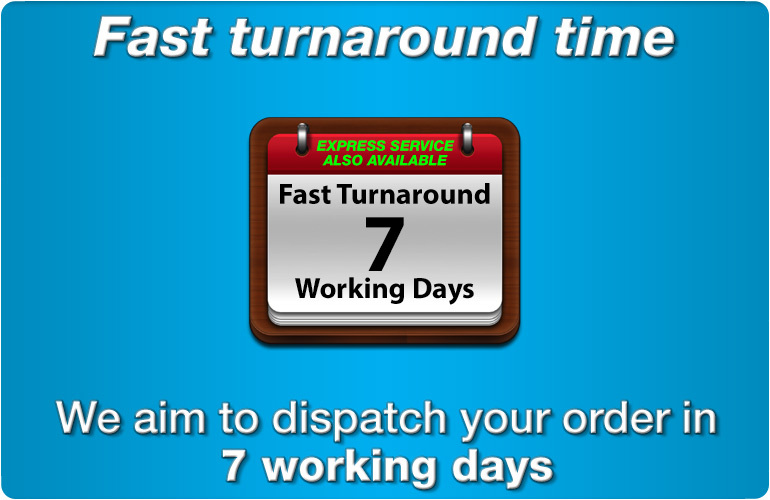 When your order has been printed and checked, it is dispatched to you via next working day courier. Beware of companies offering turnaround times of 14 working days or longer as this is a clue that the cards are being printed in China and are being shipped in. Each and every day we hear horror stories where competitors have given a guaranteed delivery date for an order (in order to win the order) but have then failed to deliver on time. Some customers in this situation have than also placed the order with us and we have managed to print and dispatch the order in a few days and the customer has still been waiting for the original order from the competitor (from China ?) to arrive. 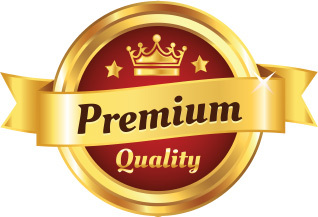 We are very open and honest, we would prefer to be honest about a turnaround time and lose the order than lie to a customer about what we can do in order to win the order. We print all our cards right here in England, unlike many of our competitors WHO outsource production to factories in China. We are proud to support manufacturing in the UK which also keeps our carbon footprint to a minimum. 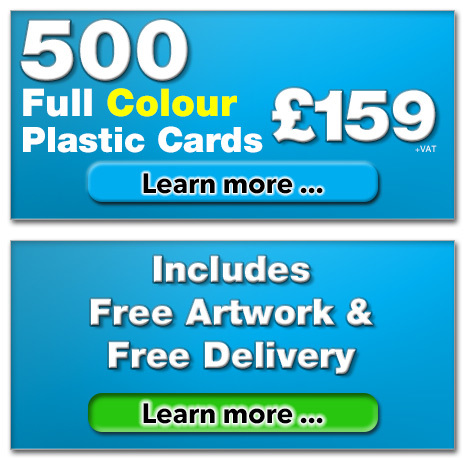 Why order your plastic cards from thousands of miles away? 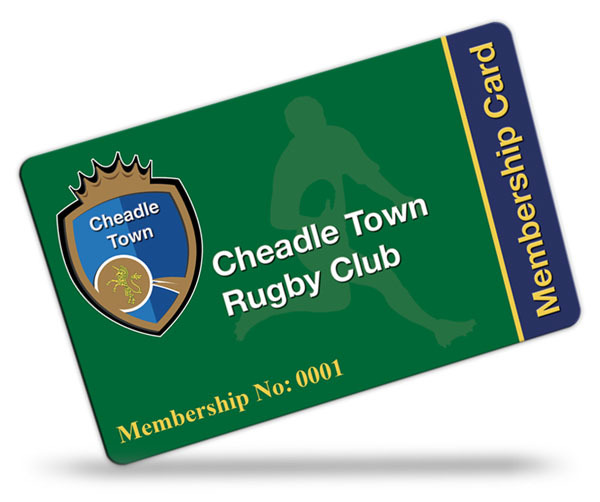 We print membership cards for many clubs both large and small ranging from local cricket clubs, football clubs, fishing clubs, tennis clubs. Because our plastic cards are printed in full colour we can include your club or teams colours within the design. Many of our customers re-order the cards each year and we change the date on the card along with the overall colour theme so it is easy to distinguish the cards from one year to the next. We can print sequential bar codes with human readable numbering and of course, when you re-order we can continue the numbering from where your previous order ended. We also print gift cards, which are popular for garden centres. Typically the garden centre gift cards are available along side the garden centre loyalty cards where points can be added to the card each time you shop to be redeemed against future purchases. Membership matters, whether it is to a sports club, retail store or service. Members are privy to a lot of benefits not available to non-members. Memberships increase a sense of pride via association, and breed loyalty. The precursor to establishing a 'members only' program/scheme or providing exclusive access or assigning VIP status is a membership card. We've printed membership cards for all manner of businesses, spanning several verticals as diverse as gardening, fishing, paintball, yachting and health foundations. 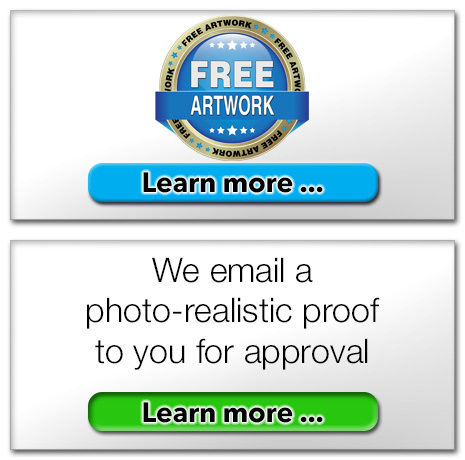 This experience allows us to suggest the most appropriate artwork that entices and engages your customers. 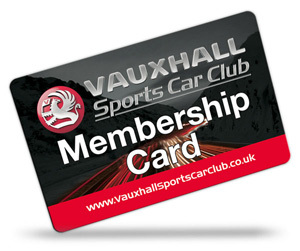 A membership card is more that just a rectangular piece of plastic that permits entry or assures attractive deals and discounts. It is a reminder of the relationship between the firm and its most important external stakeholder - the customer. Get the artwork and overall design right to create a desirable and reliable brand image. As part of our membership card portfolio, we've printed simple ones with the name, year and membership number, to full-colour metallic cards, and customised graphics/artwork. 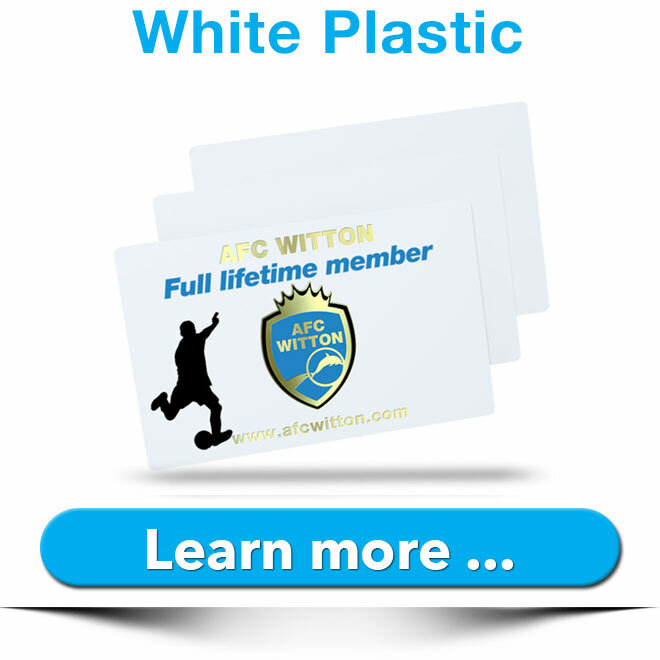 There isn't any specification we cannot handle - take a look at our portfolio to understand how we can translate your expectations into superior quality plastic membership cards. We also offer a number of optional extras to tailor cards to your specific needs, including embossing, signature strips and magnetic strips. Paper business cards can crumple quite easily in wallets. A severely creased card often suffers the same fate as any piece of paper no longer in use - it is binned. Banks and vending machines may not accept badly worn or very crumpled notes as legal tender. Similarly, faded and wrinkled business cards with illegible details are of no use to anyone. Bottom line is, paper is not durable and paper business cards lose their sheen quickly. 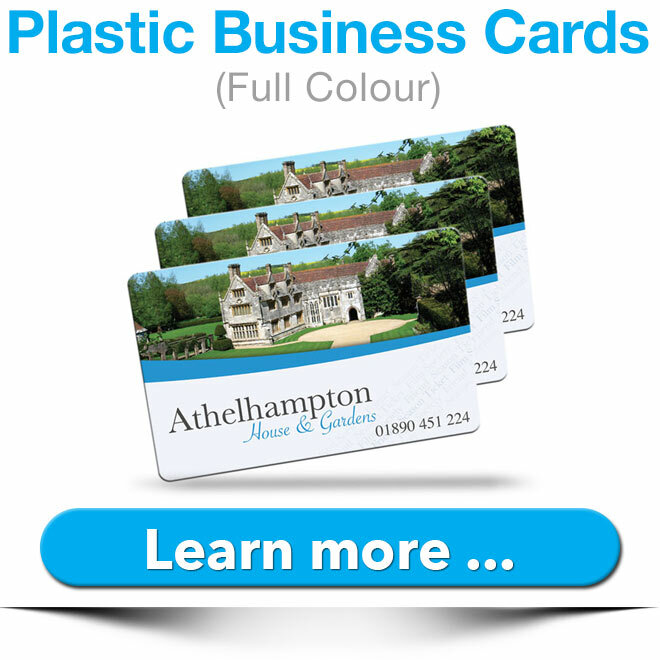 Plastic business cards are significantly more durable than paper based ones. Plastic cards are highly resistant to water damage and fading. This has made them a practical choice for professionals who work out of an outdoor environment : construction workers, gardeners, boat or cruise operators, tour guides, forest rangers, marine biologists, agriculturists and urban planners, to name a few. 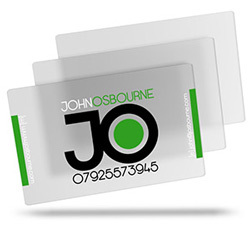 A robust, durable plastic business card is also a handy option for another reason. Some potential customers/clients may not contact you for many weeks or months. When they whip out your business card, you want it to look engaging and dynamic, and not tired and uninviting. This is more easily achieved with plastic than paper. 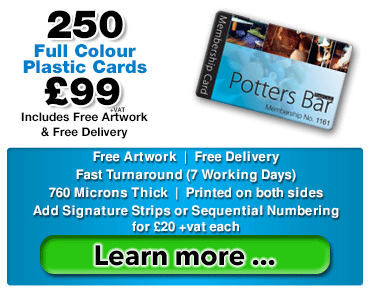 If you supply your own artwork, we will check it and fix technical issues FREE of charge so you can be assured that your plastic cards will look perfect - plus we will email a photo-realistic proof to you for approval. 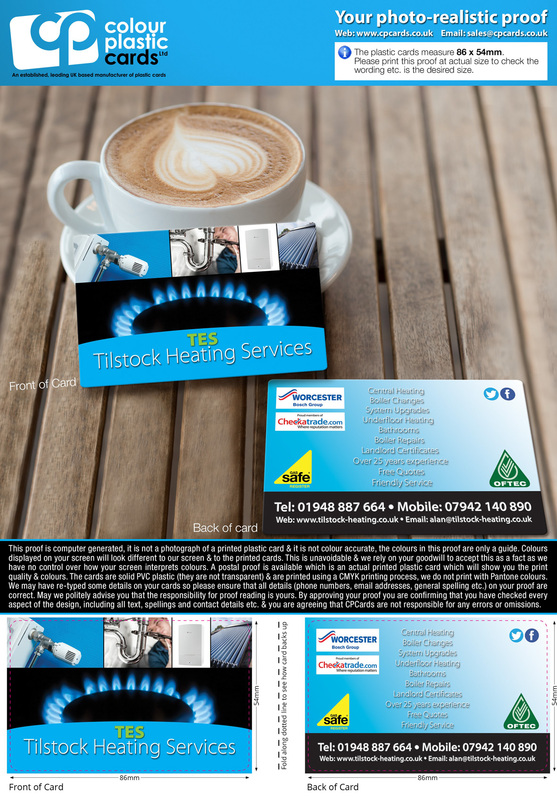 Loyalty cards are an effective means of increasing sales, generating extra business and attracting positive word-of-mouth about your company. That's not all; they can also be used to understand your customers better by tracking their shopping behaviors and customising loyalty offers accordingly. Loyalty cards shine the spotlight on new products or services : they may encourage customers to try out something new for a discount or a 'buy one get one free' offer. 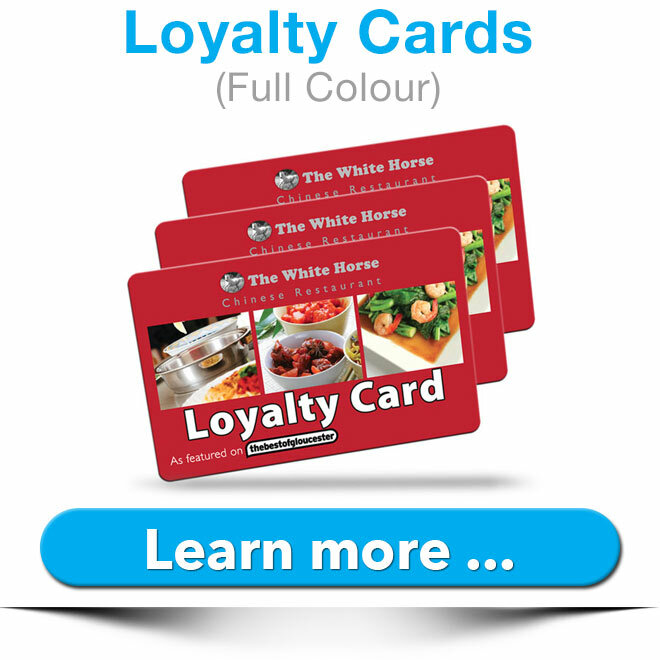 Not surprisingly, loyalty cards are as common as they come, especially in the retail sector. That means your have to match or surpass offers from competing companies to boost your bottom line and retain customer loyalty. While we cannot help you design competitive offers, we can assist with the 'optics', the way you present your loyalty programs. We have been doing it successfully with our top-quality printed plastic loyalty cards. 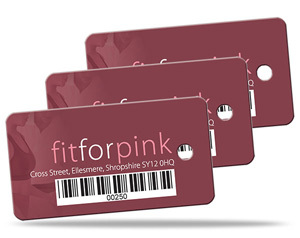 Get your loyalty cards designed in a unique, eye-catching way utilising the full colour printing process. Keep it simple and subtle or imprint your logo prominently on both sides. Sometimes, a great design and state-of-the-art construction can be a huge motivator to put the card to use. 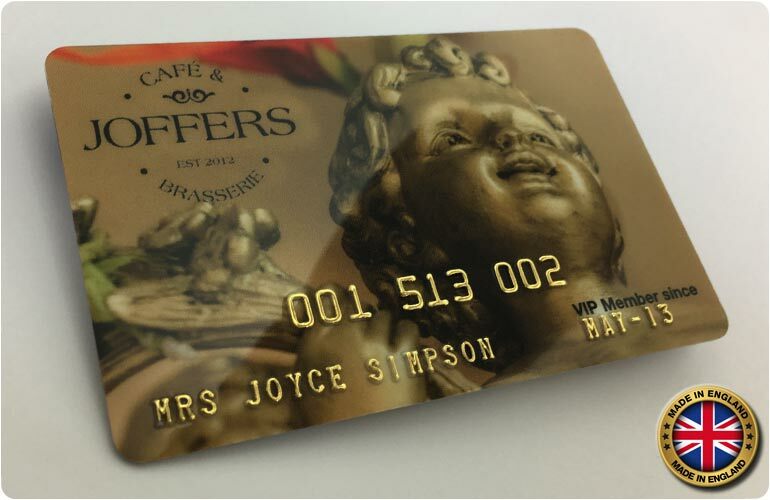 We provide assistance with artwork to enable the creation of engaging, inviting loyalty cards that don't end up being showpieces but actually get used. Want some unique business cards that grab attention hook, line and sinker? A transparent or translucent effect creates instant visual interest and intrigues people. Communicate your sense of aesthetic and distinguish yourself from the competition with translucent/transparent plastic cards with a frosted finish. The effect is achieved by polymer plastic that diffuses the light passing through it. That makes it possible to incorporate distinctive design elements such as tints or watermarks. The artwork can be reproduced with fine detail and clarity - your customers won't be able to take their eyes off your business card! Another advantage is the use of dazzling metallic inks on the plastic, which are extremely popular among our clients. Where standard pigment inks make more sense, the overall effect is also stunning. Also make sure you consider holoprint, that looks like metallic silver until you angle it towards the light and all the colours of the rainbow are reflected! This effect is highly sought-after among entrepreneurs and design professionals looking to maximise impact. To make an informed decision on the choices and optional extras before you, review the realistic mock-up we send you digitally via email. We are committed to working around your exact requirements until you have selected the perfect solution. Initiate a lasting relationship with a one-of-a-kind translucent/transparent business card that creates a great first impression. Black signifies power, authority and mystery. It is stylish, elegant and luxurious. 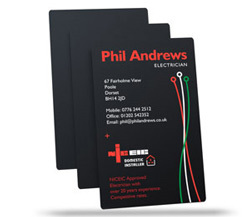 If you think a satin black business card fits in nicely with your brand image or you want your card to be unique from the more common white business cards, we have the perfect solution for you. 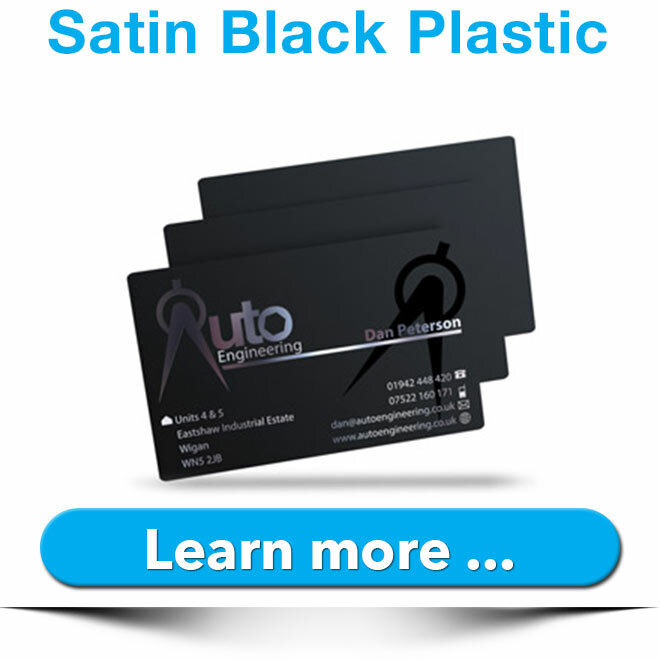 Satin black plastic cards have two key components : the black polymer plastic and a matte satin finish. The black background allows room to create contrasts in colour or texture for a dramatic effect. Another visually striking effect is gloss black ink on a matte black background. 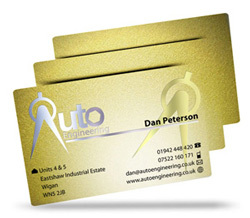 The matte satin offers a nice tactile feel and lends a healthy dose of refinement to the business or loyalty card. Thanks to an opaque surface, this printing format maximises surface area available for printing details and incorporating artwork. Though we think you should make the most of the available space, we feel that artwork spanning the full area can diminish the impact of the black canvas and get a bit over-the-top. We are happy to provide professional tips and insights on what is likely to work best. 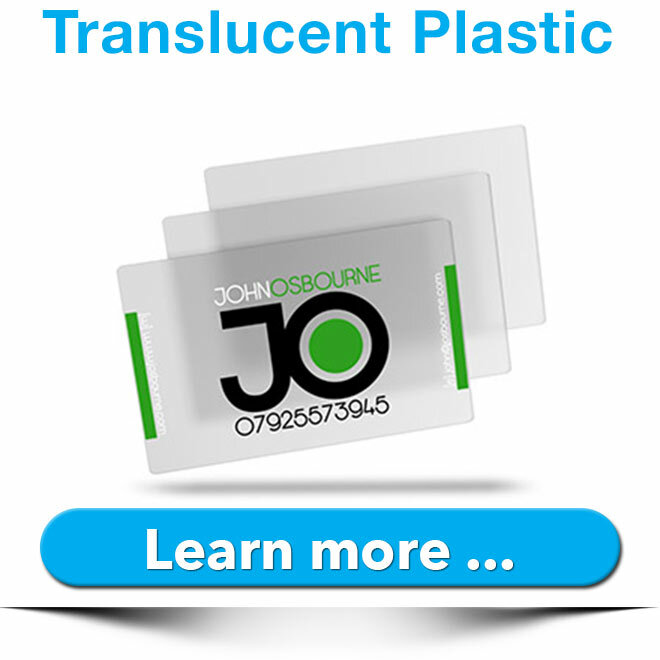 We print plastic business cards with assured durability and resistance to fading. You can expect satin black plastic cards to retain their sheen for a long time. Clients seeking a minimalist yet impactful design either opt for black or white. If you're looking for a change from the more conventional white plastic card, satin black is an effective solution to consider. The easiest way to get noticed is to shine! Metallic plastic cards have the singular purpose of grabbing eyeballs and being spotted among a wad of less memorable cards. If you seek something unique and inviting, metal is the way to go. It has serious bragging rights and is increasingly becoming popular among our clientele. Business cards are an important element of your overall brand or personal marketing efforts. You may be aiming to be conspicuous among a sea of competitors, and exploring ways to beat them on the quality and engagement value of your marketing campaigns. A dynamic card that impresses with its unique feel can do its bit to drive interest in your brand at an event, meet-up or party. 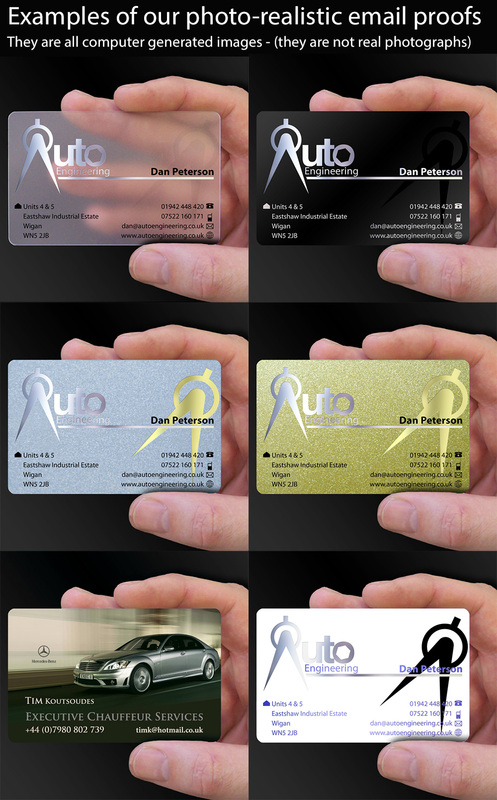 We can print metallic plastic cards in silver or gold for a luxurious and lively effect. They don't have to be business cards - you can hand out flamboyant membership cards in a striking pigment colour or a shiny metallic hue to attract high-value customers' interest. 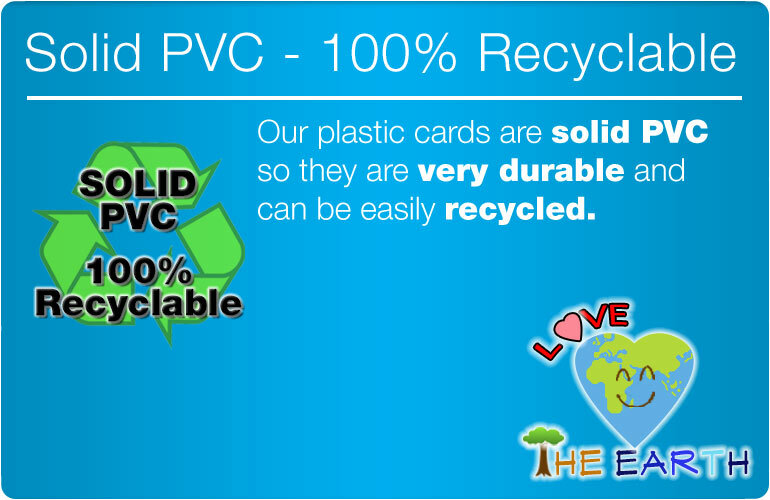 Made from plastic, our cards provide reliable strength and durability. You don't have to worry about your cards getting crumpled easily or losing their lustre within wallets or from frequent handling. 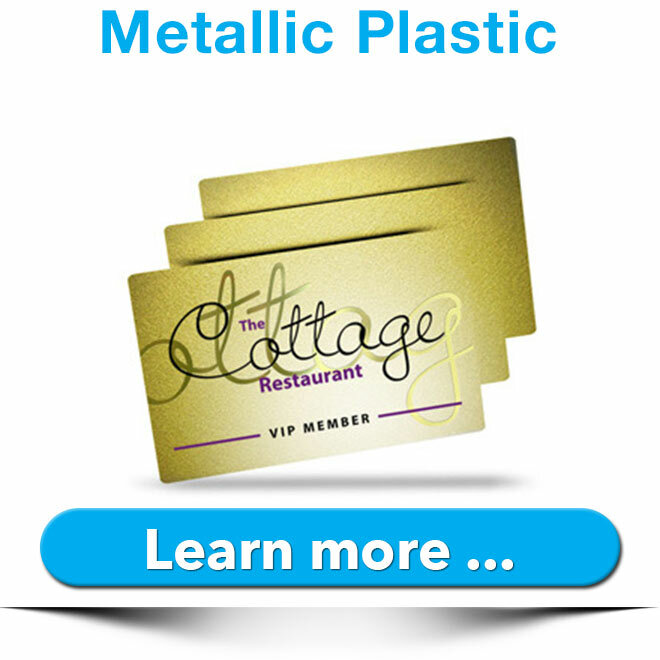 If you're worried about torn edges or damage resulting from dirt and water, metallic plastic cards can withstand the elements more effectively than paper cards. Take a look at our portfolio to determine your design direction. 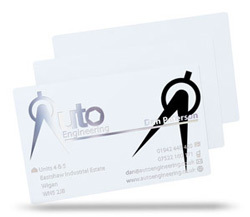 If you believe that 'less is more', white plastic cards can exude the modern, clean and professional look you seek. You can still stand out - without being flashy -– and by communicating basic contact details and artwork/logo on a pristine white, reflective surface. There is another strategic reason to choose white. In the way that black creates an attractive contrast, white helps the artwork standout and draws attention to its colours and intricacies. For instance, a holoprint on a white background can bring out the rainbow colours clearly and compellingly. A white back effect can be as appealing if not more than a matte black surface. We offer both options, so you can actually explore both or get a loyalty card in one finish and a business card in another. The choice is up to you; what we can promise is a fantastic output with crisp, vivid prints in high-quality inks and an accurate representation of the artwork you've specified. A white background is opaque, allowing printing on both sides and maximum use of the available surface area. If you want to include artwork or multiple details or messages, split them between the two sides instead of using small fonts and cramming them into a limited space. We're partial to plastic for its durability, strength and resistance to dirt and moisture. A plastic key tag is a powerful way to keep your business front-and-center in customers' minds. They have it with them at all times, use it often, and it is rare for the card to be misplaced as we're generally very careful with our home, car or drawer keys. 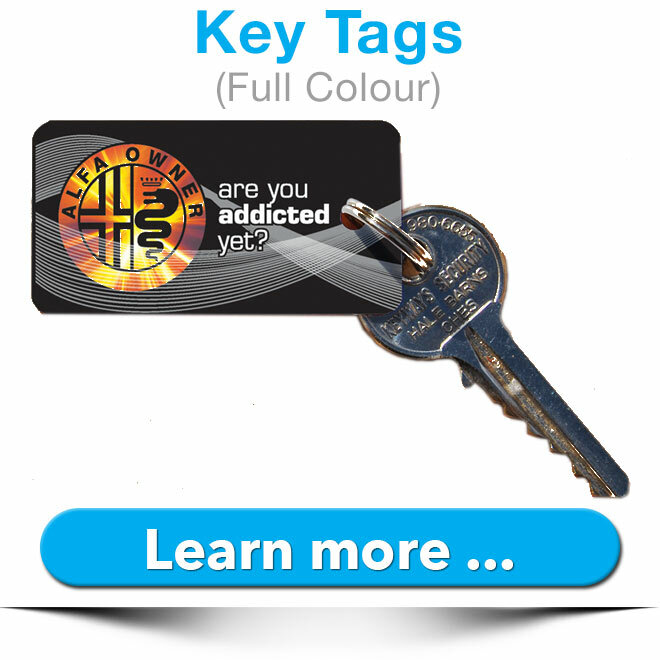 Extract maximum advantage from this unique marketing opportunity with visually striking, high-quality and long-lasting plastic key tags. Custom printed key tags help differentiate your business. A full-colour tag with vibrant colours is also easy to spot and retrieve as and when needed. For maximum impact, consider a high gloss finish that brings the key into clear view while also drawing attention to your business name and logo each time customers use their keys. Few other marketing solutions offer this kind of constant exposure and engagement. You may wish to hand out key tags to loyal customers or clients as an end-of-the-year gift. Talk to us about personalisation options where the name of the customer and a thank you message can be included along with your logo and contact details. First impressions count, so ensure your members are impressed with your organisation when you issue your membership cards. 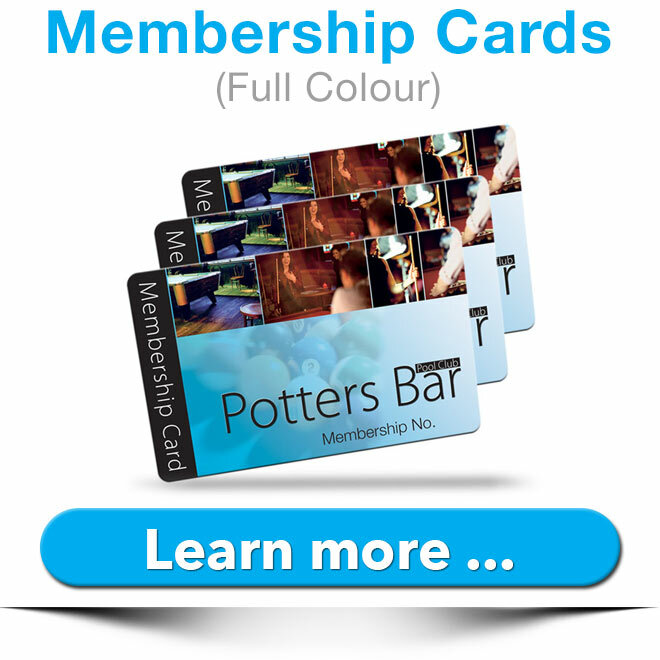 A great looking membership card will also entice your members friends and family to become members. 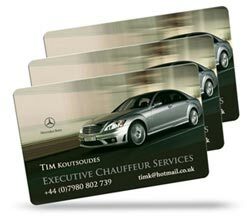 Membership cards and plastic cards have always been popular as people keep them to hand at all times and unlike card based cards they stay looking great. We print all sorts of plastic cards from plastic business cards, loyalty cards, membership cards and discount cards. We have many years experience plus designing them and we pride ourselves in offering the highest quality, produced here in England combined with a fast and friendly service and quick turnaround times. We strive to offer complete satisfaction, honest advise and do all we can to meet deadlines for rush orders. 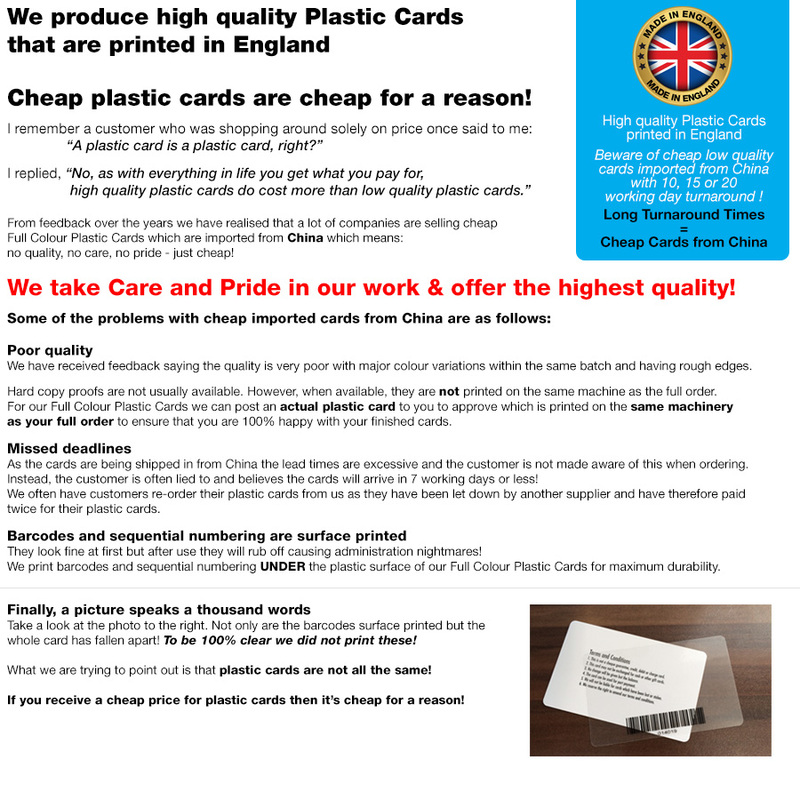 Please contact us for a quotation, also if you have a design, pop it on an email to us at sales@cpcards.co.uk then we can better assess your needs and offer you better advise. We are very quick at replying to emails so expect a reply within in minutes (during working hours) but we do sometimes work late in the evening and weekends to keep on top of the work. If you want to create your own design we have lots of artwork guidance plus various examples for you to get inspiration from. If you do send us your finished design and we notice any technical issues with it, we will try to fix the issues free of charge - we really are here to help you! So get in touch! Plastic business cards are very popular compared to the normal type of business card as they are far more durable and create a much better first impression. 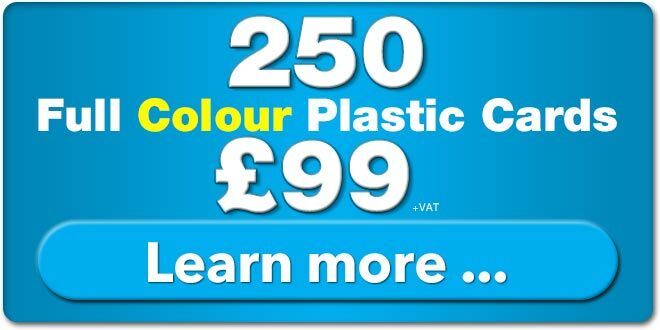 Our website shows lots of examples which we can design and produce ranging from a single colour to full colour. 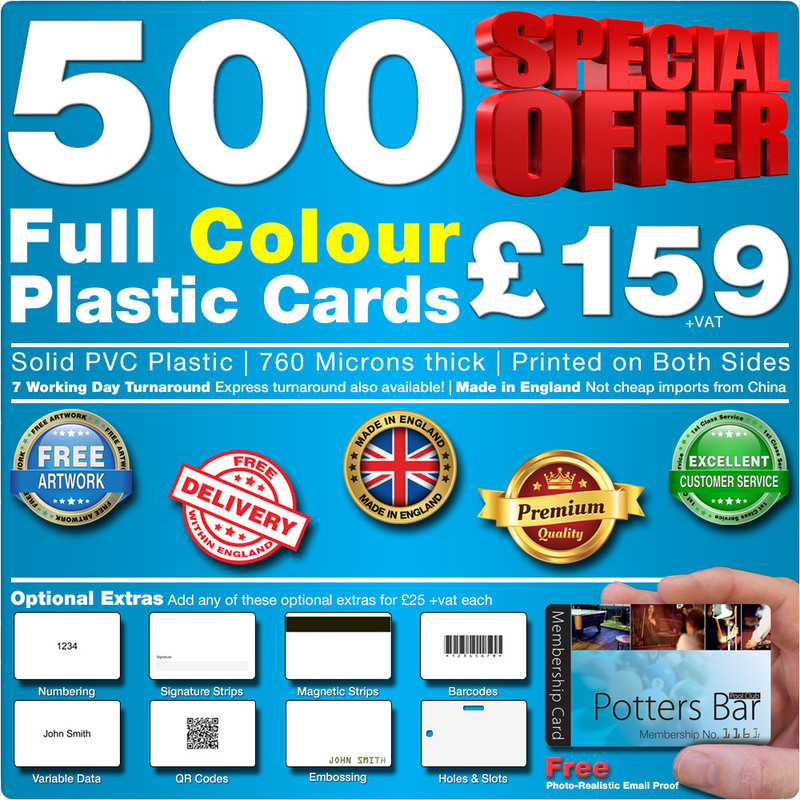 Plastic Card printing is a professional job. It is best handled by companies which have a lot of experience in this field and are reputed for their work - we are one such company! 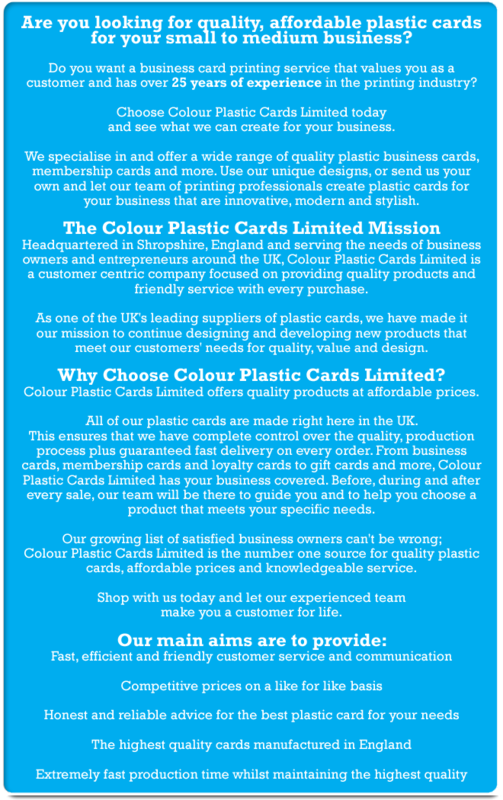 Whatever your needs are, we can take care of all your plastic card printing requirements whilst ensuring the highest quality work combined with speedy and friendly communication. 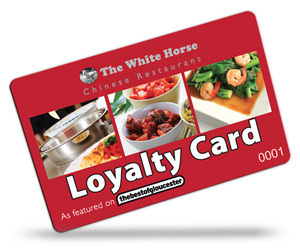 Various establishments like to issue loyalty cards to their customers. These enable them to procure various offers which are specially designed for loyal customers. It is also vital to have them professionally designed and printed. 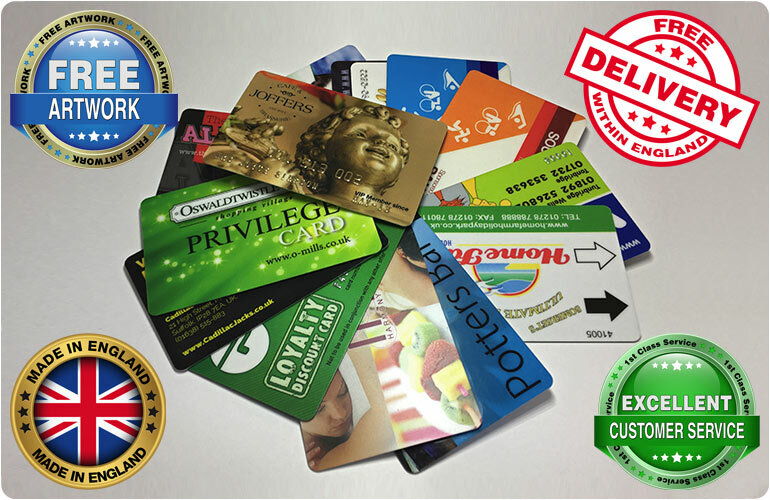 We can offer you some fantastic options for the printing requirements of your loyalty cards which include embossing, barcodes, signature strips, metallic foiling, please ask for details. 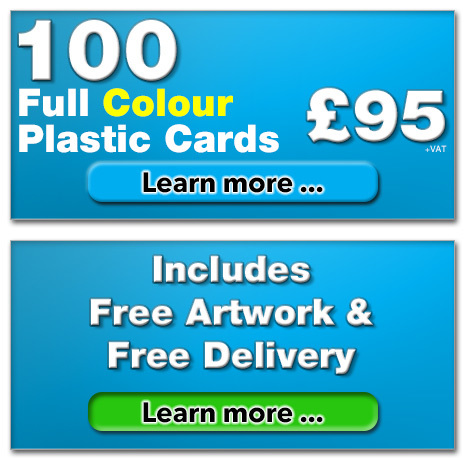 We produce our plastic cards in England which means we can offer a quick delivery as we don't import them from overseas. Lots of our customers are local to us in Whitchurch, Shropshire but we find that many of our customers come from London and the south east. 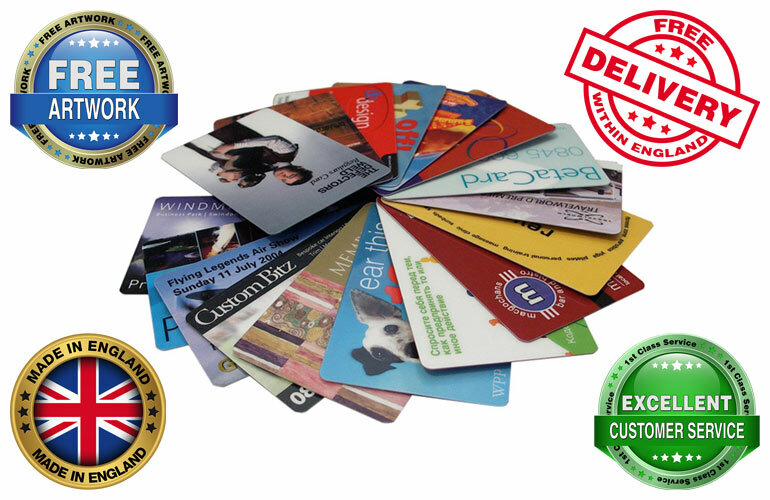 Most of our customers try to find local companies for their printing needs and come to us for their plastic card printing from areas such as Chester, Nantwich, Audlem, Wrexham, Shrewsbury, Market Drayton, Stoke on Trent, Crewe, Northwich, Warrington, Manchester Telford, Birmingham and all over Cheshire and Lancashire, Shropshire, Staffordshire and Wales. 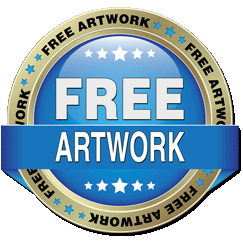 Many companies find our free artwork service is more than a help to them, they find that it is absolutely essential as they simply cannot provide artwork as they don't have the ability to do it or the budget to pay a designer. To say that our customers are pleased with the end result is an understatement! As a result most of our work comes from repeat customers and recommendations from existing customers.